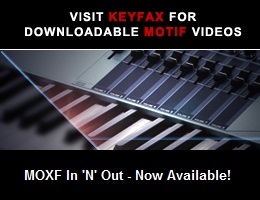 Viewing topic "Editing User Sample Motif XF"
I have a song that has a drum loop sample that was imported from my Motif ES. Importing the Song with its sample works fine. I’ve now been asked to change the tempo of the sample. I realize there is a gap in my understanding. I have read the Owner’s Manual including the pages 203-210 regarding sampling in song mode. My XF is on the current OS. I have a Flash board installed; I have about 85 waveforms on it. Their sizes are small e.g. I have used less than 1/3 of the space; it appears I am far below the other limits for the Flash board. Most of my waveforms feed ‘oneshot’ keybanks using one note e.g. C1. [Pardon some of my imprecise Motif language]. From Song mode when attempting to edit I choose Integrated Sampling. The screen appears but I am unable to select anything. Advice and links to appropriate threads will be greatly appreciated. Thank you 5pinDIN, your post on May 12th was particularly helpful [http://www.motifator.com/index.php/forum/viewthread/479760] in combination with the support article on slicing. I was able to load the waveform from the flash module and slice it etc. The “SONG” VOICE appears present in the mixing screen. However the editing does not survive a power cycle. Did you check mark “Delete Original” when copying the Sample from flash? Be sure to [STORE] the edited Song Mixing. Repeated the procedure. Confirmed all those settings you mentioned. When checking the midi data the PC was for “001” “Initialized V”. When setting it to “000” for the “Waveform . . .”, the First note of the slice sounds and the rest of the chromatic notes are silent. The first section of this guide concentrates on PATTERN mode, however, you can also work in a linear SONG with a few alterations. The Motif XF uses context sensitive functions. Certain options only appear in the appropriate context. It matters what mode you are in when you sample or import your data. If you are using SONG mode, the Phrase data will be written once to a linear track, the Voice assigned will be inserted in the Track data (the XF will place a Bank Select and Program Change event at the top of the track to ensure that the phrase data recalls the appropriate Sample Voice). You can then use the “TR LOOP” function to make the pattern cycle. TRACK LOOP lets you cycle any region of data. Perfect for making a sliced audio loop work in a Song. Make sure you sample or import your data while you are in the Mode you intend to use. Perhaps that’s where the difficulty lies. See Loop Playback Settings - [SF2] Loop on page 143 of the XF Reference Manual. EDIT: If you’re not getting the “Slices” while editing the sample, I suggest that you go through the support article using the sample provided in the ZIP file, and see if you can get the expected result. I tried it (in Song mode) and wound up with the slices covering C3 through E4. Let us know if you get that far. If that works satisfactorily, it’s important that you next “Press [ENTER] to fix.”, or you’ll lose the slice data. That step creates the new, sliced, Waveform. In the case of the sample from the support article, Waveform 002 has 17 KeyBanks, with the key range I mentioned (C3~E4). Must have been user error. After repeated tries before and after my posts, It Worked! You’re welcome - I’m glad you got it working. As with many of the more involved procedures on the Motifs, perseverance usually pays off.